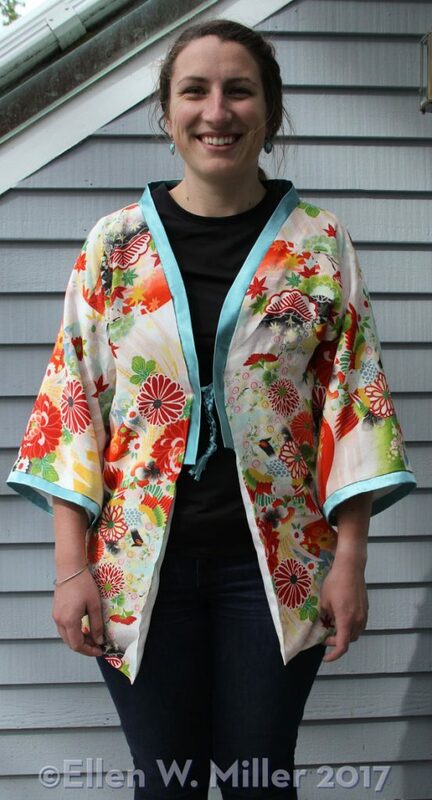 My niece once removed Alice received a child’s kimono similar to this one from her aunt/ my cousin Abby. Alice wanted to alter the kimono by shortening the torso and sleeve lengths so she could wear it as a fun top. What a great idea! I started by taking apart the sleeve and torso hems. The more I took the kimono apart the more the dirt and stains on this lovely fabric became apparent. Here, at the center of the photo, you can see the lines of dirt that marks the clean seam allowances that had been tucked inside the sleeve. Alice and I agreed to take apart the rest of the kimono and wash it to see if we could reduce the dirt. Here is the same piece of fabric after washing. There is still a clear dirt/seam line, but lighter, and the entire piece is much cleaner. These two kimonos, the one pictured on the dress form and the one Alice received, came from my grandparents. My grandparents spent several years working in Japan in the early 1960’s; when they came home they brought a kimono for each of the girl grandchildren. We wore the kimonos for special occasions, Halloween costumes and dress-up fun. I would not be surprised if Abby’s kimono was never cleaned. 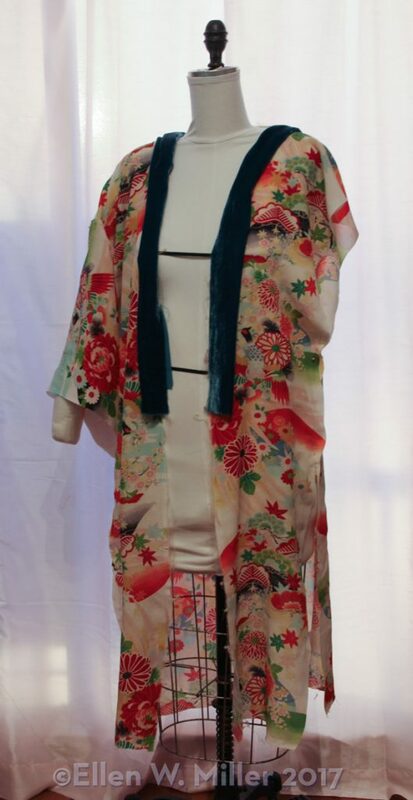 Dry cleaning was a luxury for us and with the wool interlining, the kimono would have been difficult to wash.
To quote Wikipedia and Liza Dalby: Kimonos are traditionally made from a single bolt of fabric called a tan. Tan come in standard dimensions—about 36 centimetres wide and 11.5 metres long—and the entire bolt is used to make one kimono. 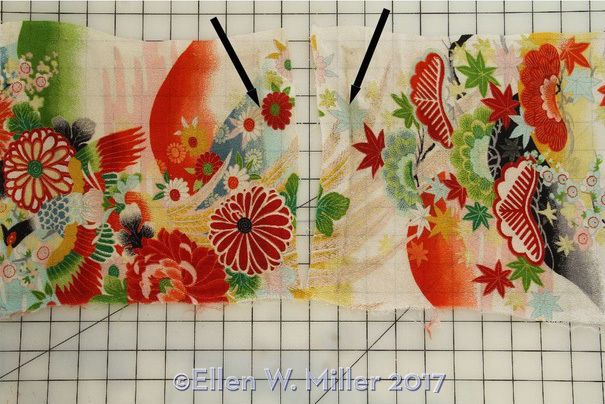 The finished kimono consists of four main strips of fabric—two panels covering the body and two panels forming the sleeves—with additional smaller strips forming the narrow front panels and collar. 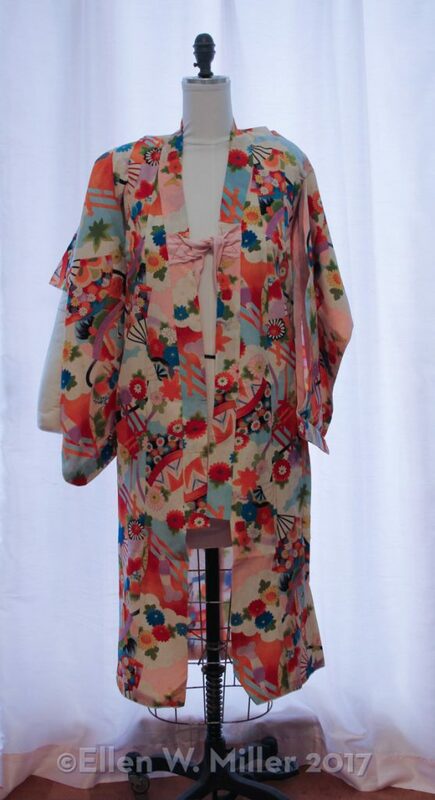 Historically, kimonos were often taken apart for washing as separate panels and resewn by hand. 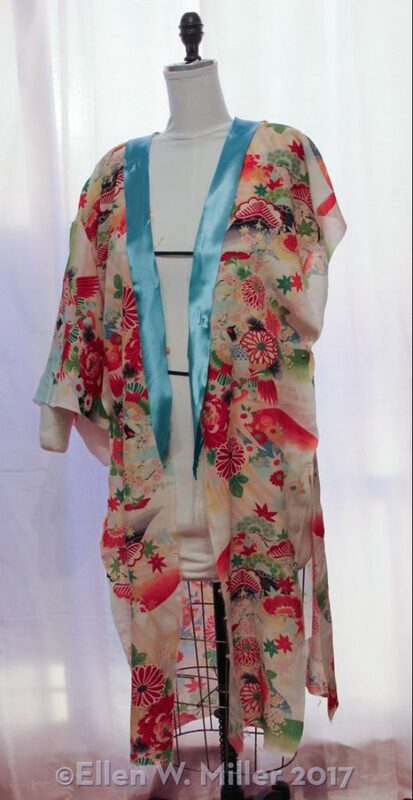 Because the entire bolt remains in the finished garment without cutting, the kimono can be retailored easily to fit another person. Dalby, Liza (2001). Kimono: Fashioning Culture. Seattle: University of Washington Press. ISBN 9780295981550. OCLC 46793052. Once the kimono was partially sewn back together, I draped 2 different pieces of fabric to try as new collars. A dark teal velvet collar? A light teal polyester collar? I thought the light teal polyester worked better with the bright colors of this children’s kimono. 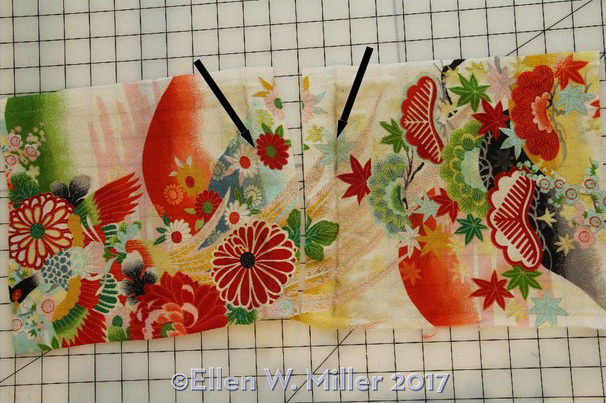 Once the kimono was the kimono and sleeves were shortened, I applied a bias strip as the collar and along the sleeve edges. I braided some bias cord to use as fastener at the front. 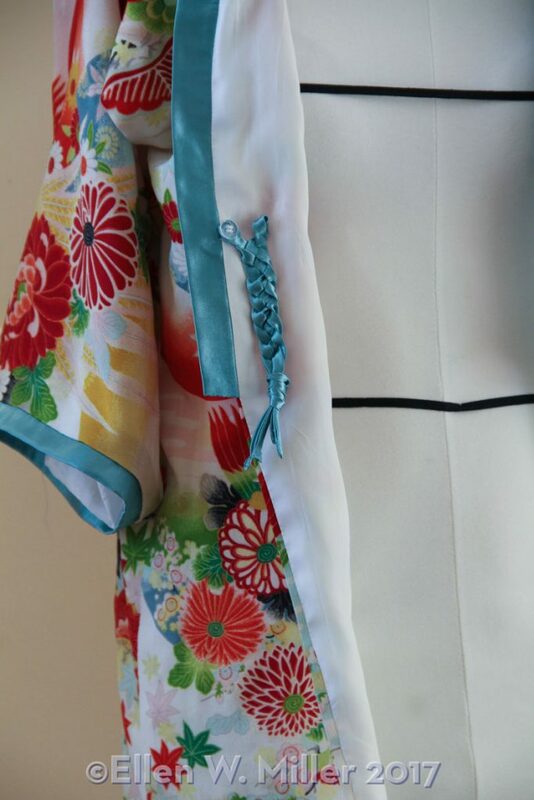 Alice said she wasn’t sure she wanted a fastener, so I made the braid removable by sewing some clear buttons into the kimono. The braided tie can be hung on the buttons or unbuttoned to be removed. Here is Alice wearing her new kimono.